To forge a deeper connection and a more rewarding sense of involvement with the world around us. With these aspirations buzzing in their heads, they did what anyone in their situation would do: They moved to Rarotonga. (Search it in Google Maps. You’ll find it right there in the middle-of-frickin-nowhere.) They lasted just four and a half months before returning to Los Angeles, but the experience trying to adapt to the island became Mark’s launching pad for a grand project to remake his family’s life. 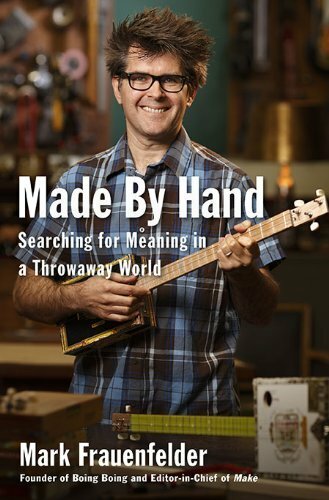 Made by Hand: Searching for Meaning in a Throwaway World, his amazing new book, is the story of that quest. We watch Mark raise chickens (in a remote-controlled chicken coop! ), make musical instruments (a cigar box guitar! ), plant a garden (watch out for the evil gophers! ), keep bees (smoke makes them drowsy! ), and do a bunch of other strangely inspiring things to recast his life around a greater dose of self-direction and a deeper sense of purpose. Along the way, we learn several valuable lessons that apply even to those of us who aren’t exactly running out to buy an Alexander veil. The new do-it-yourself culture is all about taking back responsibility for your life in ways big and small. Mark’s quest for the perfect espresso drove him to open up his perfectly adequate, very expensive, espresso machine, and hack it into an even better one. DIY means you control your gadgets, and by extension, your life — they don’t have to control you. You will make mistakes. Lots of them. But the only way to achieve mastery in any area is to set goals beyond your reach. Mark is honest about chronicling his failures as well as his successes. We spend so much time in online worlds that it becomes habitual. Making things by hand breaks that virtual spell. Mark found his projects to be the perfect antidote to the “uneasiness” that crept in after too much time disconnected from concrete reality. 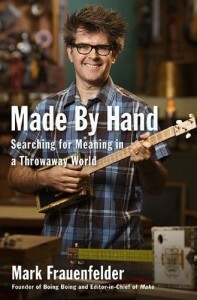 You can watch an interview with Mark at Boing Boing, or learn more at the Made by Hand website. You can also buy the book here, here, and here. Check it out. It’s real treat. What a fascinating example of a life in flow. Let’s see, building a chicken coop: clear goal, check; immediate feedback, check; and a balance between challenge and ability, (in Frauenfelder’s case) check! Increasingly in our automated, consumerist culture, we view effort as something distasteful when, in fact, the investment of time and effort it takes to make things rather than buy them results in so much more meaning and lasting enjoyment.